A few years ago I stayed in Carnoustie and went across the Tay Bridge to St Andrews a few times – all I really noticed of Dundee then was the huge oil rigs immediately east of the city centre awaiting repair or decommissioning, and how the city’s waterfront was blighted by dual carriageways and lots of traffic queueing to get onto the bridge. Those remain true, although I also now know just how hard it is for pedestrians and cyclists to get across those roads, despite the efforts to open up the waterfront. I also know that they’re on reclaimed land, and the historic city centre (basically nineteenth- and twentieth-century) is largely intact just inland. As with so many cities, the docks and railway sidings along the waterfront are being regenerated, which in the case of Dundee means (from west to east) a huge Tesco, some new loft-style apartment blocks, a Premier Inn, Captain Scott’s ship the RRS Discovery in a dry dock, and, best of all, just before the road bridge, the new outpost of London’s V&A (the Victoria and Albert Museum in South Kensington – see below). This opened in September 2018 and I like many others noticed the publicity and wanted to take a look, but I was also here to cycle with Rob (qv) for a few days, to Perth, St Andrews, Carnoustie and elsewhere. 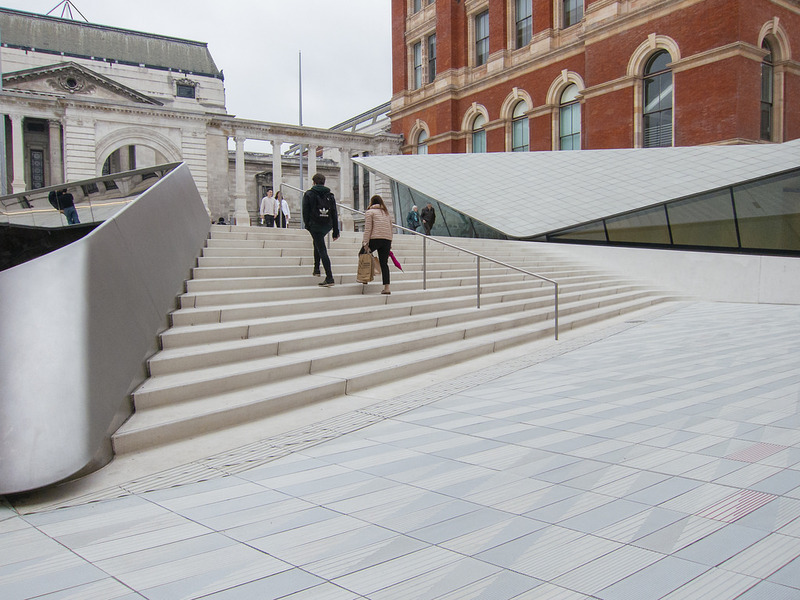 To deal with the V&A first, it’s stunning externally, with a prow jutting out over the Firth of Tay, but also echoing the cliffs of Scotland’s east coast (with a ‘cave’ that you can walk or cycle through) and very striking but functional internally. The permanent display, on the history of Scottish design, is a bit smaller than one might expect but does give a great overview of one of the many things that makes Scotland special. For many people the highlight will be the Oak Room from Miss Cranston’s Tearooms in Glasgow, designed in 1907-8 by the great Charles Rennie Macintosh – I found it surprisingly low and dark, but definitely part of a continuum from Odön Lechner’s delightful Blue Church and other Secession buildings in Bratislava. There’s a lot more to see, but my eye was caught by the theatrical posters (by John Byrne) and designs (by Bunny Christie and Finn Ross, who produced a stunning (and award-winning) set for The Curious Incident of the Dog in the Night-Time, which I saw just a month or two ago). It’s also interesting that the UK’s video games industry was largely created in Dundee (essentially because Clive Sinclair’s Spectrum ZX was manufactured in the Timex factory from 1982) – Lemmings was released in 1991, and Grand Theft Auto in 1997. In 1997 Abertay University (formerly Dundee Institute of Technology) launched the world’s first degree in computer games design, and there’s been no looking back since. 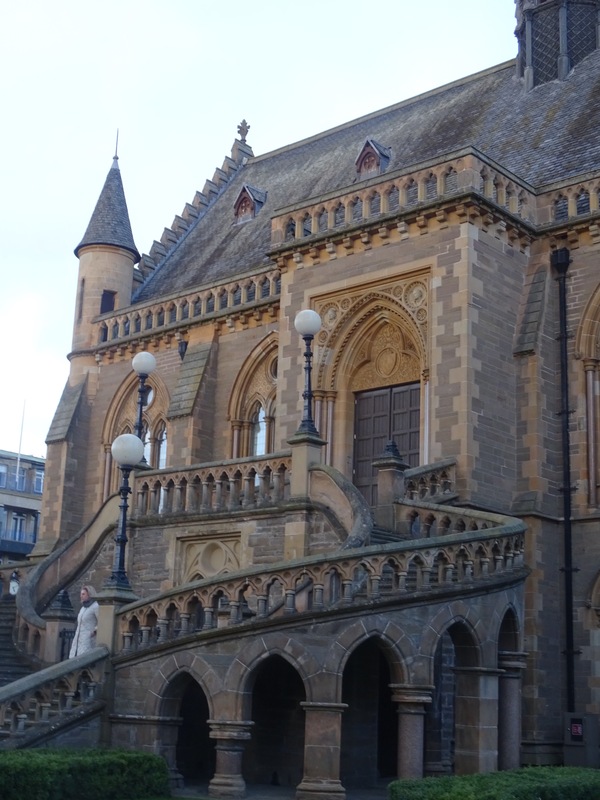 Dundee is also a biotech hub, arising out of the design of ingenious surgical instruments – so I should feel at home, as Cambridge is of course also a silicon and biotech hub. Silicon Fen and Silicon Forth, perhaps. By sheer coincidence, a day after I got home to Cambridge, I read that a prototype ZX Spectrum (no case or anything fancy like that) has been donated to the city’s Centre for Computing History by John Grant who used it to create the machine’s BASIC code. The permanent display at the V&A is free, and so is the city’s main museum, the McManus Museum and Art Gallery – this was founded in 1869 as the Albert Institute for Literature, Science and Art, allowing me to refer you both to the V&A in London (see below) but also to the Royal Albert Memorial Museum in Exeter, which I wrote about just a week or two back. Actually a lot of places remember Prince Albert, so it’s not the total coincidence it might seem. Anyway, it was closed for a refurb from 2006 to 2009 and is now in fine fettle, with good history displays leading up to the Dundee and the World room, showing off items from around the world collected by missionaries and merchants, and also by two redoubtable lady journalists sent off on a round-the-world trip in 1894 by DC Thomson (yes, the Dundee newspaper company that would later be famous for publishing the Beano and the Dandy), which turned out to be quite a coup for the company. Incidentally, the University of Dundee, not wanting to be outshone by Abertay, launched Masters courses in Comics and Graphic Novels in 2016, despite DC Thomson’s famous refusal to allow access to its archives. There’s plenty more here, including ‘the best collection of late Victorian Scottish painting’ (displayed in a gallery built in 1889 with cunningly curved walls) – yes, there are various paintings by Rossetti, Millais, Landseer and Sargent, but I was as usual more interested in the slightly earlier portraitists Nasmyth, Raeburn and Ramsay. There are also quite a few paintings by William McTaggart (1835-1910, the so-called ‘Scottish Impressionist’), and a couple by John Maclauchlan Milne (1885-1957) the so-called ‘Dundee Colourist’ – he was a friend of Samuel Peploe and Francis Cadell, but there aren’t any works by the Scottish Colourists themselves (bright vibrant painters, somewhere between the Post-Impressionists and Canada’s Group of Seven). Finally, and perhaps not always on show, there’s Wilhelmina Barns-Graham (1912-2004) who was born in St Andrews and kept studios there and in St Ives, giving another link to my recent travels. 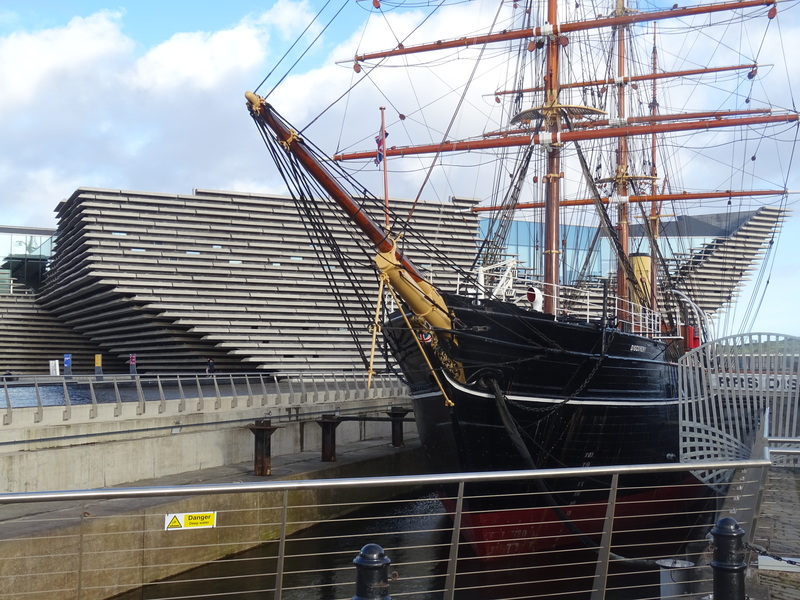 Until the V&A docked here, Dundee’s best-known sight was the RRS (Royal Research Ship) Discovery, famed for taking Scott and Shackleton to the Antarctic, although she was also used for the Australian/New Zealand expedition of 1929-31, led by Douglas Mawson, and spent time in the Canadian Arctic too. I remember her being moored off the Embankment in London in the 1970s when she was flagship of the Royal Naval Reserve – I think I may even have been aboard, as my father was in the navy and also the Deep Sea Scouts (she was used by the Sea Scouts until 1954, definitely before my time). Anyway, we didn’t have time to visit, although a joint ticket with the Verdant Works (a former jute factory) is reasonable value. 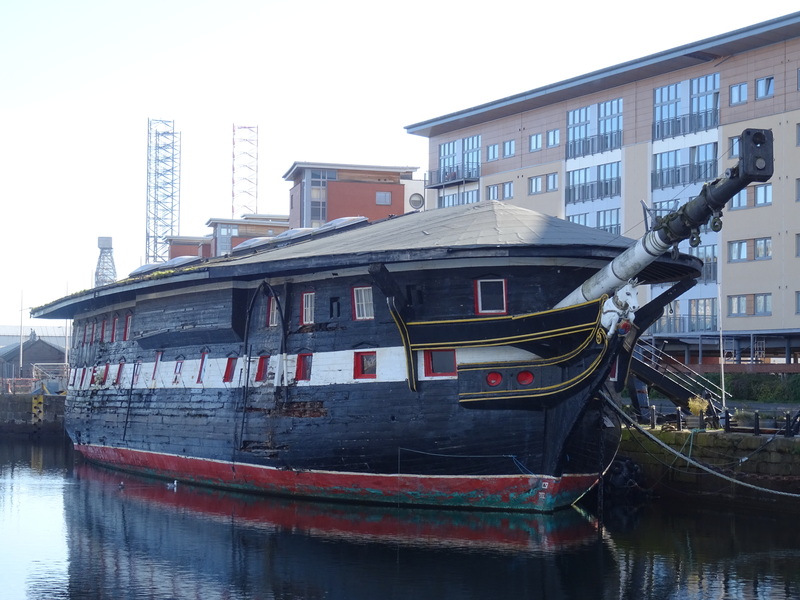 I did see HMS Unicorn, another wooden ship built in 1824 and at once converted to a floating depot ship – masts were never fitted, and the main deck was roofed over. She was towed from Chatham to Dundee and hasn’t moved since, so she’s in very good condition – but the first impression was so ludicrous that I couldn’t face visiting, even if I’d had time. 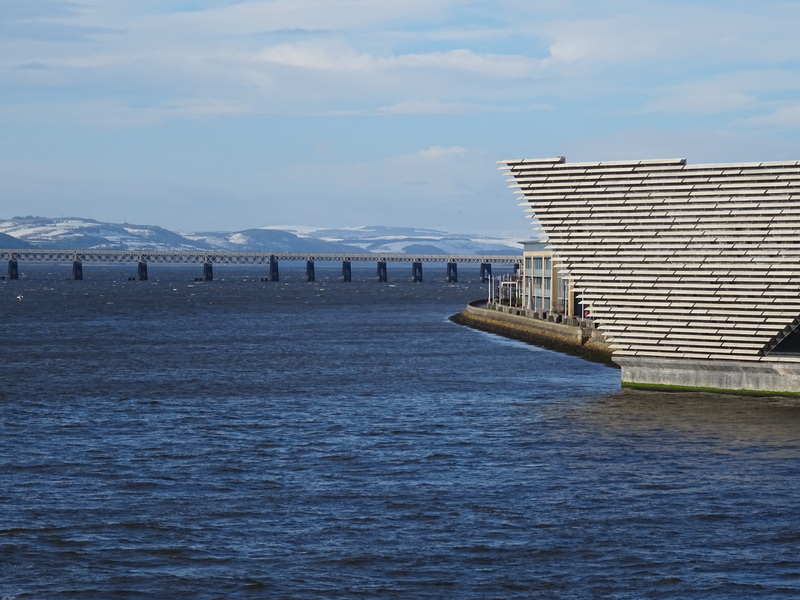 I did stick my nose into Dundee Contemporary Arts, which is celebrating its twentieth anniversary – it was between exhibitions, but there was a very energetic children’s art day going on and the bar is lively too – definitely recommended. After all this history and culture, and cycling, we needed a drink, of course – but I think I’ll leave that for another post. In order to contrast and compare properly I popped into the V&A in London a month or two back – the decorative arts are not my thing, so I don’t often go there, but it is a pretty impressive place and has seen a lot of new development recently, such as the Sackler Courtyard (a new entrance from Exhibition Road) and the Photography Centre, displaying some of the vast archives of the V&A and the Royal Photographic Society, as well as some of the earliest cameras. In addition to recent blockbuster shows on David Bowie, Pink Floyd and various fashion icons, the V&A has just staged the major Videogames exhibition, which not exemplifies their urge to be relevant, nay trendy, but is also perfect for transfer to Dundee. 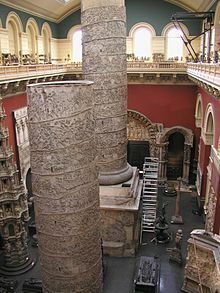 The historic collections are in great nick too, in particular the Cast Courts, reopened in November 2018, housing full- size replicas of Michelangelo’s David, Trajan’s Column (important to Romanians and those of us who have written about Romania) and much more. The V&S was notorious for its Saatchi & Saatchi advertising campaign in the 1980s which described it as ‘An ace cafe with quite a nice museum attached’, but the Refreshment Rooms (the first in any museum, opened in 1856) really are amazing, with extravagant tiling and stained glass. The third room was one of William Morris’s first commissions, and one day I may write about visiting the Morris Museum in Walthamstow relatively recently – but probably only if somebody nags me.